Dunkin’ Donuts Celebrates Its Appiversary! Today we are excited to be celebrating the one-year anniversary of our Dunkin’ Mobile App, the app that keeps you running. 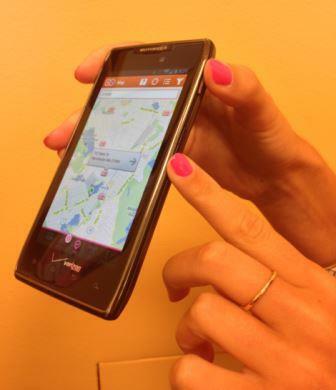 The Dunkin’ Mobile App, which has been downloaded more than 3.5 million times since the launch, offers a variety of fun and helpful features, such as virtual DD cards and mobile offers, and is available for both iPhone® and Android™ mobile devices. Mobile Payments: Pay with a DD card that’s stored in your phone. This makes payments faster and easier than ever and mobile payments are accepted at participating U.S. Dunkin’ Donuts restaurants. You can upload a Dunkin’ card purchased from Dunkin’ Donuts restaurants by entering the card number and PIN/ID# located on the back of the card or you can purchase a Dunkin’ card directly through the Dunkin’ Mobile App. 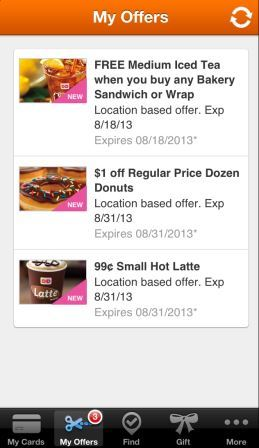 Mobile Offers: Redeem exclusive offers right from the app to save on some of your favorite items. Gift of Dunkin’: Give the gift of Dunkin’ and buy virtual DD cards for your friends and family. Simply go to the “Gift” toggle on your Dunkin’ Mobile App and choose from a variety of specialty themed mGifts, a monetary value and the delivery method – text, email or Facebook Connect. You can even add a personalized message to make your mGift unique. 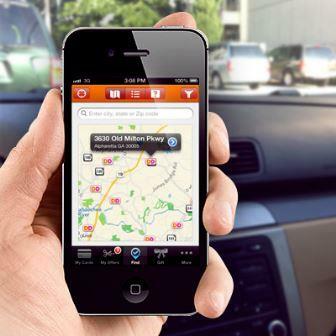 Find A Dunkin’: Use the Dunkin’ Mobile App to find the store located closest to you. Simply go to the “Find” section of the app, enter a city, state or zip code and the app shows you the DD’s in that area on a map. Select the specific restaurant on the map that you would like more information on and it will instantly provide you helpful details on that location. These details include the restaurant address, hours of operation, store phone number and an option for directions which will synch with your mobile device’s map function to lead you directly to the restaurant. There are also symbols at the top to let you know some of the key features of that Dunkin’ Donuts restaurant. 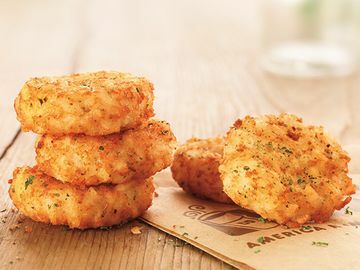 You can see whether that restaurant has a drive-thru, sells Dunkin’ K-Cup® packs, offers Wi-Fi and 24-hour service and other store-specific features. Celebrate our Appiversary with us! 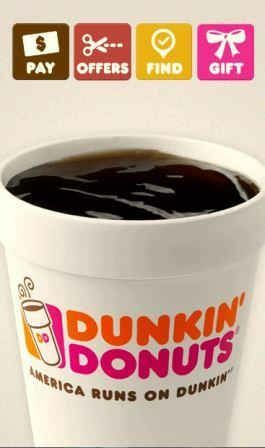 To celebrate our Dunkin’ Appiversary, we’re holding a special Twitter sweepstakes for our fans! Beginning today and continuing through 5 PM on Sunday, August 18, followers of @DunkinDonuts on Twitter are asked to share with us their favorite Dunkin’ Donuts restaurant. 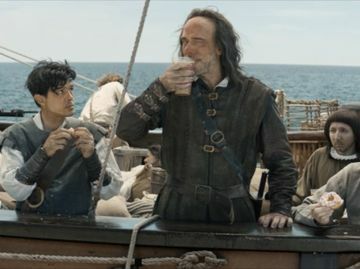 Fans can participate in the sweepstakes in either one of two different methods. 1.) 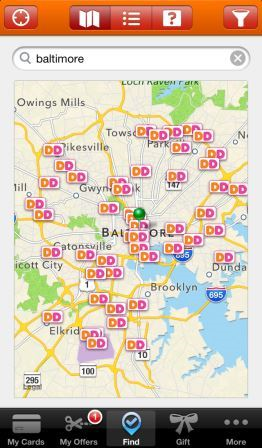 Fans are asked to visit the Dunkin’ Mobile App and locate their favorite Dunkin’ Donuts restaurant in the app’s “Store Locator” function. 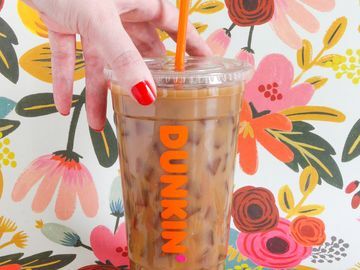 Fans who take a screen grab* of this and tweet it to @DunkinDonuts using the special hashtag #DunkinApp, are eligible to win a $10 mGift to enjoy their favorite Dunkin’ Donuts food and beverages. • To take a screen grab (or screen shot) on an iPhone device, press the home and sleep buttons at the same time. The screen grab will then be sent to your camera roll folder in photos. • To take a screen grab on an Android device, press the power button and volume down key at the same time. The screen grab will then be sent to your image gallery. 2.) Fans can also enter the sweepstakes by tweeting a photo of their favorite Dunkin’ Donuts restaurant to @DunkinDonuts using the hashtag #DunkinApp. They will be eligible to win a $10 mGift. 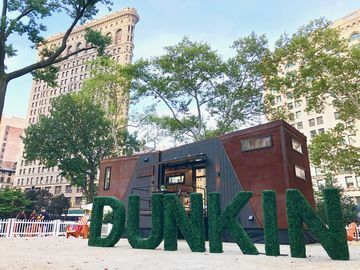 A total of 365 participants, representing the days since the Dunkin’ App launch, will be selected to win and each prize winner will receive one $10 mGift. 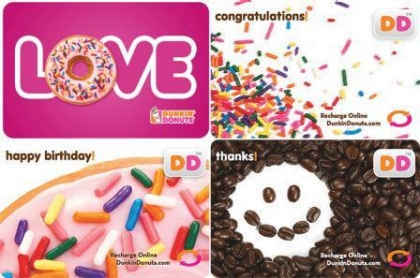 For additional terms and conditions related to Dunkin’ Donuts’ Mobile Appiversary Sweepstakes, please visit here. 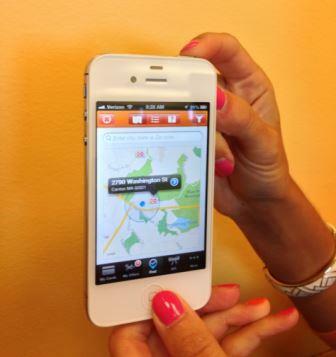 What is your favorite feature on the Dunkin’ Mobile App? Tell us on Facebook!